Finding freedom in abstraction, painter and mixed media artist Suzanne Yurdin has been inspired by the arts since she first started combing through her parents’ art books as a child. Today, the Virginia-based artist captures a fresh and modern approach in her colorful, designed works. The architectural underpinnings of her earlier works are now more pronounced, capturing the joy of artistic creation and power of a strong line. What first got you interested in the arts? I was exposed to the arts throughout my childhood. My parents frequently took us to museums, galleries, and concerts and showed us culturally rich places of interest during family excursions. They also had a large collection of art books representing various genres. We know your travels have inspired a lot of your artwork. Was there one place or experience that inspired you the most? There is no singular place in the world that has influenced my work more so than others but rather I search to give the viewer a “sense” of a place. My solo exhibition at Studio Gallery in 2013 was my first major show featuring architectural landscapes, which were my response to the architecture of Gaudi I experienced in Spain. However, one client suggested while looking at a painting he was reminded of the cathedral in Prague. Since I’ve never been to Prague, it was gratifying to know the images were being translated into an individual “sense” of place. 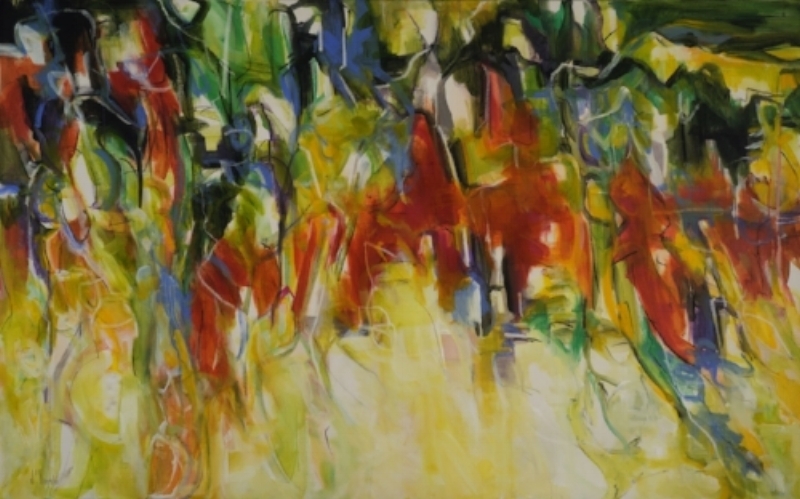 What's your favorite thing about working with abstract art? Since early on my work has been abstract. It’s what I relate to and what challenges me everyday. It’s complex and difficult to convey messages through abstract art. I must find a way to connect the viewer to the art. Describe your work in three words. Colorful, mixed-media, textured. Ever experience an incredible breakthrough moment in your artistic practice? Many times! I can’t imagine not having breakthrough moments. As an artist it’s those experiences that feed us and propel us to push our boundaries of artistic expression. Any time, anywhere I get to paint is the ideal situation. The time spent at work is something I dream about, pine for and cherish every single day. Studio work is far different that working plein air but each experience has its pros and cons. Music is an active part of my working process no matter the location. What would you say to someone experiencing your work for the first time? In the normal course of things I would have to say it’s usually the viewer who starts the dialogue. Often it is with a question related to the inspiration behind the work, which is a significant introductory point for many people. But, going back to giving the viewer a “sense” of place, my instinct is to not give a definite answer. I truly don’t want to make the viewer see something just because of the inspiration or even a title. This is especially true with abstract art. One must engage on one’s own visceral level. Like it or not, see something or not, respond to the color and shapes perhaps or not….it’s all part of the process. We know you like to work in mixed media. What's the best part about working in that medium? The most challenging? The best part of mixed media is the freedom it allows for my mark making. I actually find it difficult not to have lines of some kind guiding my horizontal, vertical and diagonal passages and overall composition. The challenging part is keeping them in tune with the paint. I work from light to dark by building on layers of paint through the lines and the mixed media. Dec 1 and 2, 2018 / Open Studio Falls Church, Virginia - THE ONLY time to see my extensive inventory, including all work not shown on this website, with special studio pricing all weekend long! Just in time for the gift giving season! More Info.